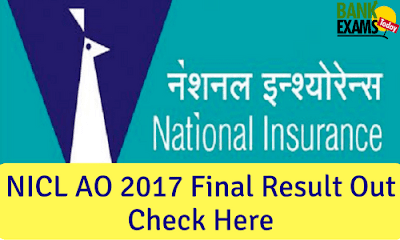 NICL(India’s oldest general insurance Company) has released LIST OF CANDIDATES SHORTLISTED FOR THE POST OF ADMINISTRATIVE OFFICER (SCALE –I). Registration Nos., Roll Nos. and Names of the candidates who have been provisionally selected for pre-employment medical examination, following the online exam and Interviews held in the month of October, 2017 for recruitment of Administrative Officer in the cadre of Scale I.
Intimation through Email and SMS about the pre-employment medical examination will be sent to the individual candidates and the schedule for the same will be displayed on company’s website in due course. Candidates are requested to submit the documents (i.e. CGPA, Final Degree etc) as mentioned against their names within 7 (seven) days from the date of publication of this Notice.